This article was written By Jon Jung on 25 Oct 2010, and is filed under Uncategorized. In this episode, we memorialize animators Kihachiro Kawamoto and Satoshi Kon who passed away on August 23rd and 24th, respectively. 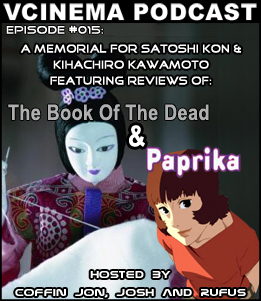 With guest host Cathy Munroe-Hotes of Nishikata Film Review, we review Kon’s Paprika and Kawamoto’s The Book of the Dead. Friends and past guests of the show, including Mark Schilling of the Japan Times, Jasper Sharp of Midnight Eye and the Zipangu Fest, and Jason Gray of Screen International, call in with their memories and impressions of the two late, great filmmakers. Download this episode from this link here. Subscribe to the site’s RSS feed here. Subscribe to the site’s iTunes feed here.